"The skatepark will be roughly 2,000 sq. ft. Rampage is a Connecticut skatepark contractor with many years of experience in not only skateparks, but general construction as well. Rampage bid the project using a Who Skates design and if it is awarded Who Skates will be building the park." It appears there will be a meeting between city folks, skaters, and riders in the near future to confirm things. Pedal Power is a part of the skatepark committee so the riders are being represented! The park is not going to be pre-fab, which is nice. From what I've seen on Who Skates site they make some rad sh1t...they're responsible for the new Windsor Park too! It may be small, but hopefully it's fun!! 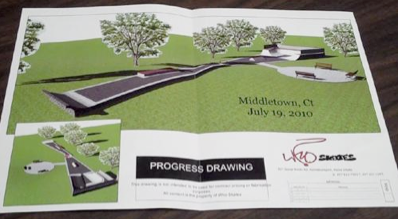 It appears the Middletown Skatepark will be complete before the Winter and will be letting bikes in. The park looks pretty small and has a limited number of obstacles/ramps, but I guess beggars can't be choosers, at least the skaters and riders are getting something. CLICK HERE to read the article from the Press. Southwick, Windsor Locks, and Howard's!